When I got in the car this morning, the car’s onboard temperature gauge said 25 degrees Farenheit. I often complain that these enhancements to automobiles are really TMI (too much information) for the early morning commute. But that temperature is a whole lot better than the negative 9 last week and the single digits that went on until this Sunday. The whole landscape is frigid and cold. We are all bundled up and trundle through our worlds trailing hats and gloves and all sorts of things as we don and shed our layers depending on the temperature and the weather. When I called my mother this past weekend I asked her if she’d gotten any snow. She said they’d had a little but it had all melted. I told her we had a lot of snow on the ground and it would snow a little every day until — pause — forever. She laughed and said it must feel that way. Yesterday, the young men of the family across the road cleared off their frozen pond and played ice hockey most of the day, taking advantage of the bright sunshine and making a lot of fun out of the freezing cold. It was fun to watch from my warm comfortable kitchen window. My circle is practicing living in harmony with the seasons this year. Each quarter we have a “sponsor” or two. Deities that help us understand what qualities and essences we are studying. The gods we work with give us a charge. I find that They usually evokes in me some creative work. Caillech is our sponsor for the winter. I first met her many years ago when I was taking an advanced course on Wicca, emphasizing telling our stories. It was a time when I was still adapting to the hard winters in Central New York. She appealed to me with her ability to shift and change, the shawl about her shoulders, and her ability to survive and thrive in the hard landscapes, along with her gracious relinquishment of power in the springtime. As I told her story, I became her and channeled her wisdom. It was a very special moment of embodiment of the Goddess. 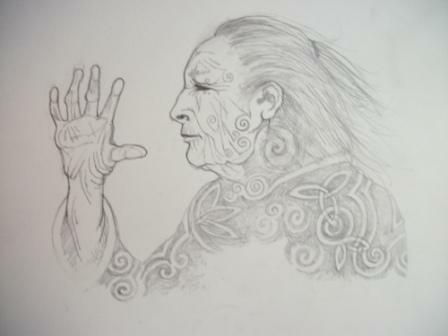 In all the Celtic myths and legends, there are variations of the Cailleach, the ruler of Winter. She appears at Samhain and rules and protects the world, the weather, the land and the animals. At Beltane, the Brighide appears and Cailleach hides beneath a holly bush. When she enters the world, she brings death, sharp storms, ice, and snow. She created the lakes, streams and rivers; and the rocky cairns fell from her apron. The world is hers beginning at Samhain. Her staff, when it strikes the land, turns everything into ice and snow. She is especially protective of wolves and deer as she moves through the land though all animals are in her heart. She herds the deer and protects them. Swine, wild goats, and wild cattle are also her creatures. She is the great ancient earth mother, the embodiment of the Dark Mother archetype, who destroys, creates, and destroys. When she first appears, she is wearing a great plaid over her shoulder. She starts to wash her plaid and when she is finished, it is pure white and the land is covered in snow and frost. Her name means “hag,” “old woman,” or “old wife” in Gaelic. There are many variations and legends found throughout the Celtic speaking lands. She has the ability to transform from old woman to a beautiful one according to her mood; and her moods change the weather and the land. And the Old Woman do tell you and instruct you. Just as you should not be afraid of your own. And find beauty in the bleak, cold, deadness of winter. There is beauty and hidden treasures. To find the hidden riches. So is new creation and joy. And be beloved by yourself and those you love. May you find joy and blessings in the harshest and sweetest moments. This completely embodies how I experience Callieach. Thank you! Marvelous! Callieach, unbeknownst to me, has always embodied the heart of my creativity. I feel her wisdom in the work I tend to every winter. Blessed be! There was a very important message in this for me today…Thank you, Gail.